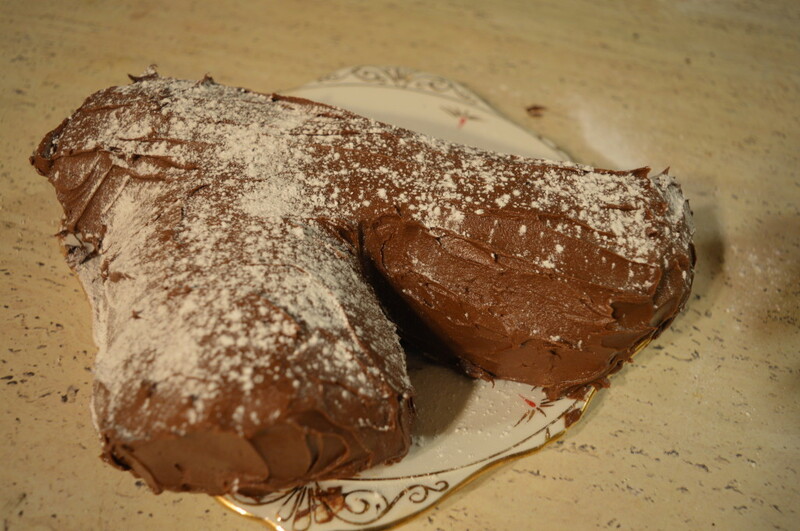 This recipe was inspired by my dad who spotted a photo of a rather impressive yule log on Twitter and sent me the link to it. I’ve never made a yule log before so decided this was the year to give it a go. There are a whole host of recipes on the Internet but I decided to go for this Nigella recipe as it had good reviews. It does produce a lovely moist cake that was deemed a success by Mr Birdie. As it doesn’t include flour it also has the benefit of being gluten free. I would say the quantities for the icing are rather generous especially as the icing is quite rich. I kept the decoration for mine quite minimal with just a sprinkling of icing sugar but you could of course go to town with trees, animals or if you feel so inclined some meringue toadstools. This will make 12 generous servings. You can make it in advance (up to 1 week and store in an airtight container) or alternatively freeze it for up to 3 months. Any leftovers need to be stored somewhere cool in an airtight container. There is a lot of whisking involved so you will definitely need a freestanding mixer or an electric hand whisk to make this. You will also need a large Swiss roll tin (mine was _ by _). 1) Preheat your oven to 180°C/Gas mark 4/350ºF. 2) In a large, clean bowl whisk the egg whites until thick and peaking, then, still whisking, sprinkle in 50g of the caster sugar and continue whisking until the whites are holding their peaks but not dry. 3) In another bowl, whisk the egg yolks and the remaining caster sugar until the mixture is moussy, pale and thick. Add the vanilla extract, sieve the cocoa powder over, then fold both in. 4) Lighten the yolk mixture with a couple of dollops of the egg whites, folding them in well. Then add the remaining whites in thirds, folding them in carefully to avoid losing the air. 5) Line a Swiss roll tin with baking parchment, leaving a generous overhang at the ends and sides, and making sure the parchment fits into the corners to help the paper stay anchored. 7) To make the icing, melt the chocolate – either in a heatproof bowl suspended over a pan of simmering water or in a microwave – and let it cool. 8) Put the icing sugar into a processor and blitz to remove lumps, add the butter and process until smooth (alternatively you can do this by hand by sieving the sugar into a bowl and then creaming it with the butter). Add the cooled, melted chocolate and the tablespoon of vanilla extract and pulse or mix again to make a smooth icing. 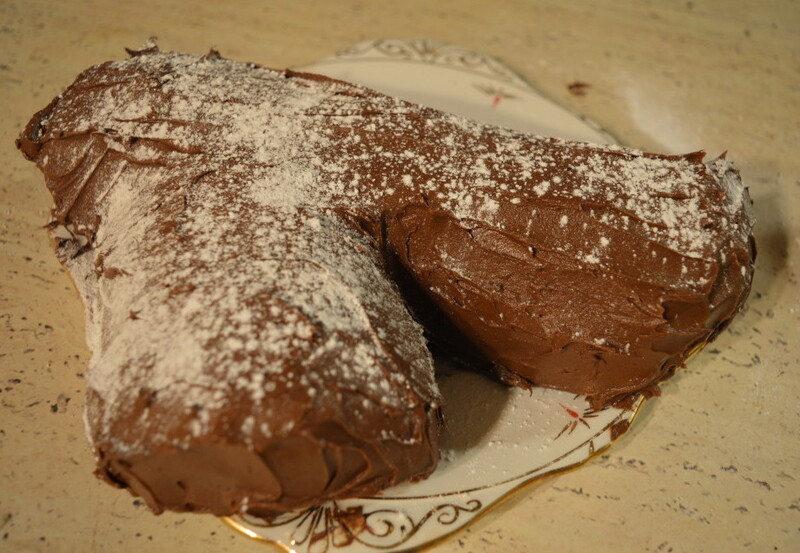 9) Sit the flat chocolate cake on a large piece of baking parchment. Trim the edges of the Swiss roll. Spread some of the icing thinly over the sponge, going right out to the edges. Start rolling from the long side facing you, taking care to get a tight roll from the beginning, and roll up to the other side. Pressing against the parchment, rather than the tender cake, makes this easier. 10) Cut one or both ends slightly at a gentle angle, reserving the remnants, and place the Swiss roll on a board or long dish. The remnants are to make a branch or two; you get the effect by placing a piece of cake at an angle to look like a branch coming off the big log. 11) Spread the yule log with the remaining icing, covering the cut-off ends as well as any branches. Create a wood-like texture by marking along the length of the log with a skewer or fork, remembering to make circles as tree rings, on each end. 12) Decorate to your taste dusting with icing sugar or using decorations. If using icing sugar make sure you use quite a bit, pushing it through a small sieve and letting some settle in heaps on the plate or board on which the log sits.